Do you know Quinoa? If you don’t, you should surely be introduced. It is a super grain aka perfect protein. Pronounced keen-wa (I know–your tongue wants to say key-no-ah), it has more protein and calcium than milk. 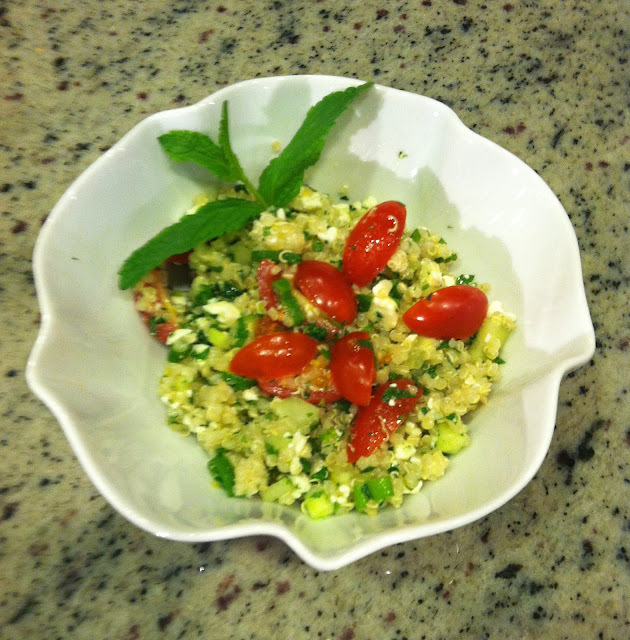 Quinoa contains all eight essential amino acids and is gluten free. Versatile, it is excellent cooked up like rice, made in to flour, or added to recipes. 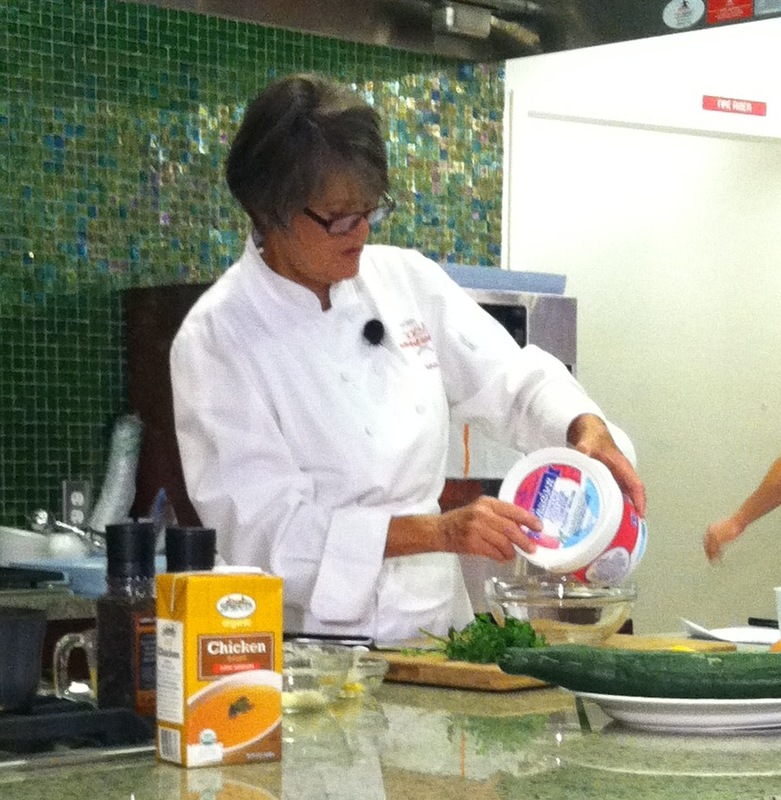 When I attended Macy’s Regional Cooking Demo, one of the recipes Chef Joanna Talbott made used quinoa in a delicious salad. Perfect as a main dish (you can add some chicken or shrimp for even more protein) or as an appetizer (fill lettuce leaves with the mixture), this dish utilizes fresh vegetables and herbs and can even be made a day ahead. 1) Before beginning, rinse quinoa to remove bitterness. (MLG note): Since quinoa are pretty small, it is tricky to find a strainer that is small enough so that the quinoa won’t escape. I found mine at Ikea a few years ago when I first started cooking quinoa. If you can’t find a strainer, try Joanna’s method: put quinoa and water in a plastic container with a lid. Loosely hold the lid up against the opening and slowly drain out the water. Repeat a couple of times. 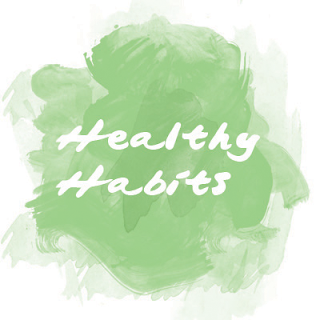 2) Bring quinoa, 1/2 teaspoon salt, and 1-1/4 cups water to a boil in a medium saucepan over high heat. Reduce heat to medium-low, cover, and simmer 10 minutes. Remove from heat and let stand, covered for 5 minutes. Fluff with a fork. Spread quinoa on a large rimmed baking sheet; let cool. a) Chopping all the veggies and herbs can be time consuming. I am not a patient chopper. But for this dish, I am willing to give it a better try because the salad really does work out better the more finely chopped everything is. b) This salad will keep for a few days. If it dries out, add a tad more olive oil.